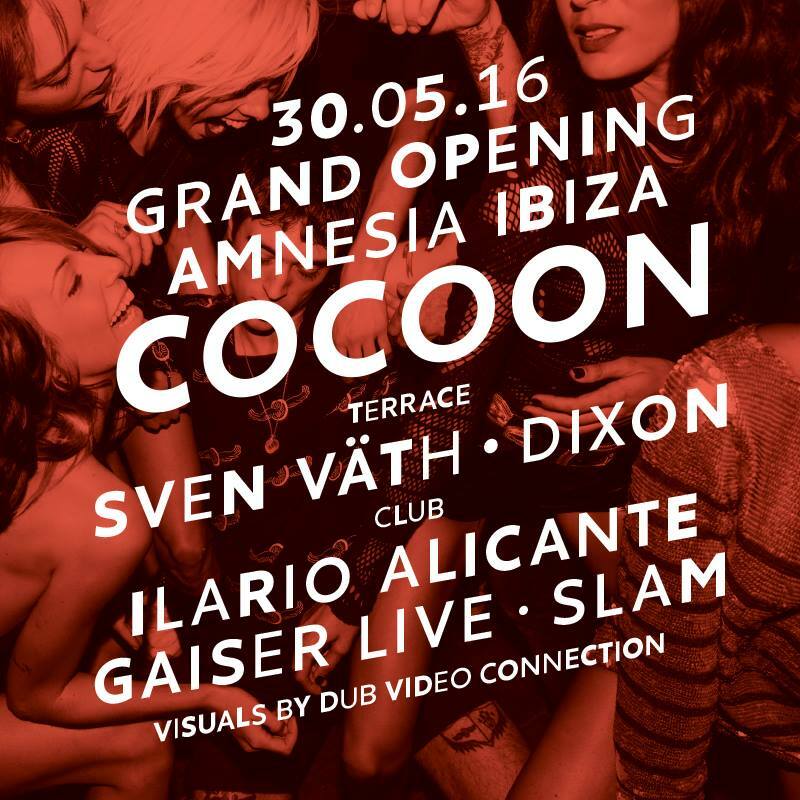 Sven Väth presents the extraordinary 17th season of Cocoon Ibiza. The team is gathering, the sun is coming and a truly massive year awaits. The family does not finally come together until the 30th May 2016 with the colossal Cocoon opening party and the best crowd in the business. Details of this legendary event and a further 18, yes 19 in all, magic Mondays in Amnesia will be released very shortly. Adam Beyer, Âme, Ben Klock, Ben Ufo, Butch, Carl Craig, Carola Pisaturo, Craig Richards, Dana Ruh, Dixon, DJ Koze, Dorian Paic, Dubfire, Einzelkind, Guy Gerber, Ida Engberg, Ilario Alicante, Joris Voorn, Luciano, Mano Le Tough, Markus Fix, Nina Kraviz, Raresh, Ricardo Villalobos, Richie Hawtin, Roman Flügel, Ryan Elliott, Scuba, Seth Troxler, Skream, Slam, Solomun, Sonja Moonear, Tim Green, tINI, ZIP. Live Acts: Âme, Gaiser, KiNK, Recondite. Club Room: Ilario Alicante, Gaiser (Live), Slam. 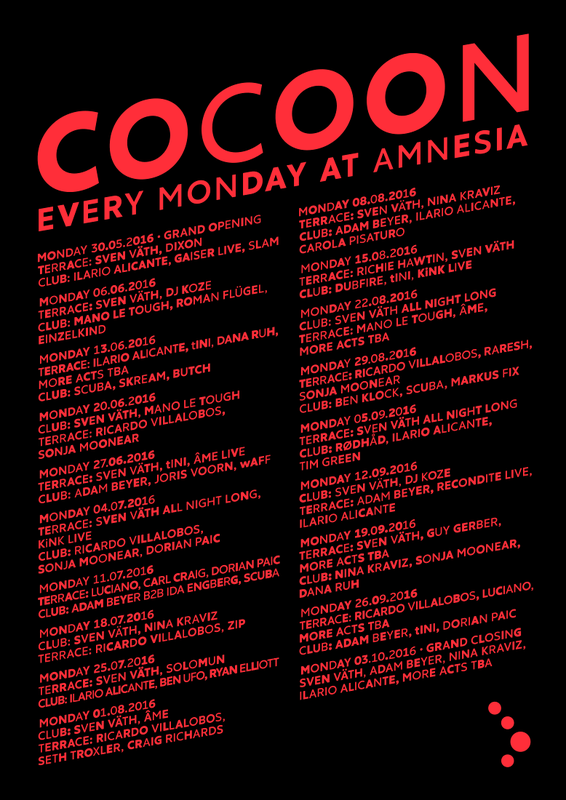 SVEN VÄTH PRESENTS COCOON : Cocoon announce full summer party calendar at Amnesia Ibiza. We are now able to announce with great pride the line-up for the 17th season of the incomparable Cocoon Ibiza. Monday nights at Ibiza, same as it ever was with the mighty Sven Väth at the helm. Looking back over the years nothing much has changed elsewhere with our obsessive team on an endless mission to bring the best possible dance music and atmosphere to one of the best clubs in the world. 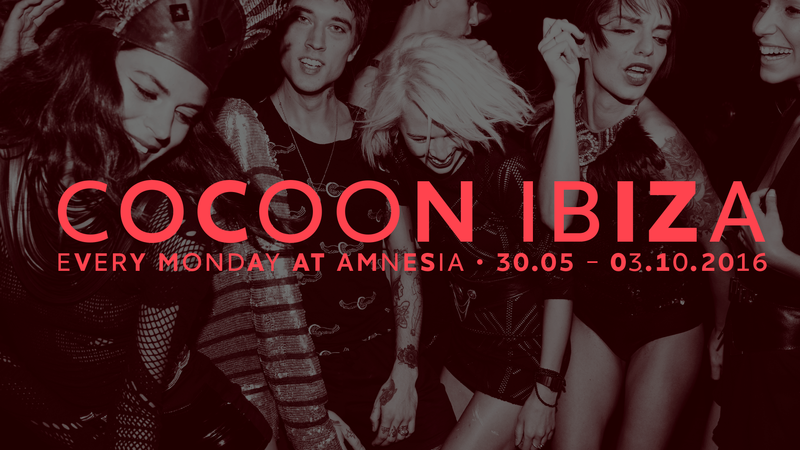 Through all the changes on the island itself our crowd that turns out on a Monday night is the one that still evokes the true spirit of Ibiza, just as Cocoon does. We never have and never will lose this sense of party and a unifying spirit. Cliche or not, this is a family affair after 16 years. 16 years defining the dancefloor and in 2016 a jawdropping selection of names to fan the flames. This will be the longest ever Cocoon season, it is almost scary and will span an astonishing 6 months storming into life on the 30th May and then every Monday into October. It is a year for records in fact, not just the jolly old vinyl, as Sven will play an incredible 15 shows. Ricardo Villalobos will this year perform 6 exclusive shows and 6 also for Cocoon favourite Adam Beyer. Nina Kraviz, Sonja Moonear and tINI are along for the ride with 4 shows and Ilario Alicante will chalk up 7 gigs. Check out the full list below and keep your eyes peeled for Dixon, Luciano, Richie Hawtin, Solomun, Mano le Tough and Âme all of them on board. Mouthwatering stuff we hope you agree and this year for the first time all presented under the auspices of Dub Video Connection who will be handling video, lights and installations. Prepare to be amazed. One last thing before you read on. Not quite a secret anymore but that does not make it any less special. Cocoon @ Tipic Formentera will also be back and smoking. A stream of special artists will be washing your way for something a touch more intimate. Cocoon has always owned Monday night, we love our Thursday nights as well. More details very soon.